Hundreds of people have gathered on the Capitol steps for the “Right to Rest Fest” each of the last three years to stand together before the legislative hearings of the Right to Rest Act. The Right to Rest Act is back – and stronger than ever in 2018! State representatives Salazar and Melton continue to lead the fight in the Capitol with their sponsorship. 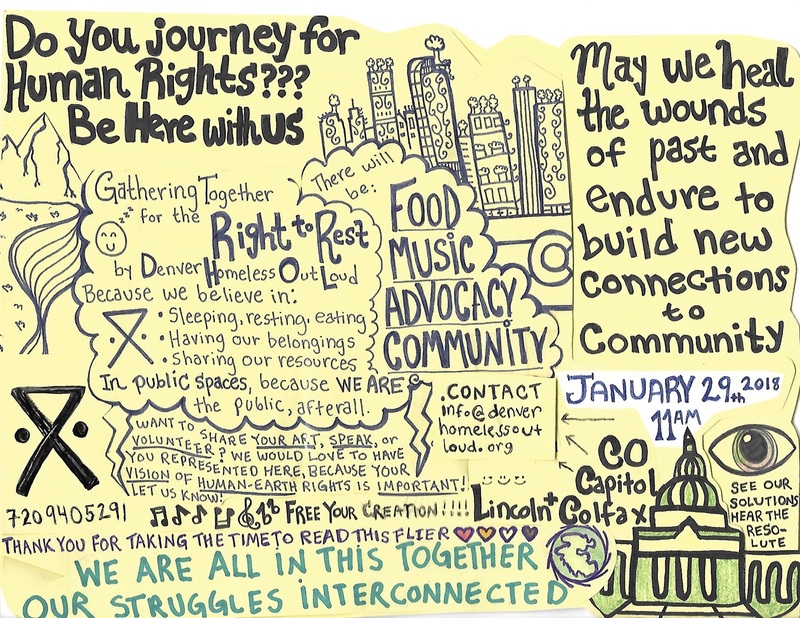 On Monday, January 29th from 11am to1:30pm, we will be back at the state Capitol for the Right to Rest Fest! Members of the public are asked to join us to speak out, eat food, listen to music, and call for the end of the criminalization of people living without homes. The Right to Rest Act, which would help end the criminalization and incarceration of homeless individuals and families, is run together with members of the Western Regional Advocacy Project (WRAP) in California, Oregon, and Colorado. The proposed legislation in each of these states is part of a response to the growing trend of cities creating laws that make it illegal to sit, sleep, stand, and share food in public space. Housing prices are skyrocketing in many parts of Colorado, and efforts to address this housing crisis don’t come even close to keeping up with the numbers of people who are losing their housing every year. Sweeps of homeless people trying to survive outside without homes are escalating across the whole state. People experiencing homelessness are being pushed around the State like a game of homeless whack-a-mole. Even in the midst of all this intense daily struggle to exist with constant police harassment under the command of city government, homeless people have been standing up for their rights and demanding this injustice end. The city of Denver is facing a lawsuit in federal court for its role in seizing people’s property in violation of the 4th and 14th amendment of the US constitution. Over the past couple of years, Denver Homeless Out Loud and other members of WRAP have documented 1,527 homeless people’s interactions with local police, private security guards, and the criminal justice system in 17 cities in 8 states. More than three-quarters of survey respondents (81%) reported being harassed, cited or arrested by police officers for sleeping outside, 76% reported the same for sitting or lying down and 74% for loitering or simply “hanging out.” These were far and away the top crimes for which homeless people were charged. A sad corresponding fact is that only one quarter of respondents (25%) believed that they knew of safe, legal places to sleep. WRAP continues its fight to protect these civil rights for all. The proposed Right to Rest Acts in both Colorado and California would overturn all city ordinaces within their respective states that criminalize homeless individuals, such as camping bans and “sit/lie” ordinances.